waves with equal characteristic length in any direction of the plane. In case (i) we get that the surface amplitude evolves according to the Kadomtsev-Petviashvili equation, in case (ii) to a cylindrical Korteweg-de Vries equation and in case (iii) to a Korteweg-de Vries equation which depends parametrically on an extra variable. In all cases we discuss two different Cauchy problems, both of physical interest: in the first, and most common, the initial datum is prescribed at a fixed instant of time in all space. A second type of Cauchy problem is obtained when the initial datum is prescribed at one position for all time. 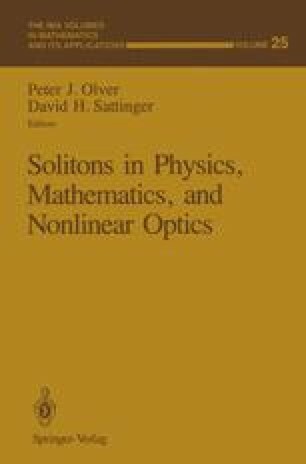 Finally, for the case (iii) a large set of one and two soliton solutions are presented.